If you’ve been following us at all, via social media or our blog or here on our site, then you know that back in our February update we announced that we were making the officially-licensed Sharknado™: The Board Game! Well… we just launched the campaign on Kickstarter. It’s here. Feedback has really helped shape this game so far. We’re turning to Kickstarter because we want to give the community the opportunity to weigh in and influence what we know will be a great game. We acquired the exclusive licensing rights to create a Sharknado-themed tabletop game in late 2015, and since then have been hard at work capturing the spirit of the films—including lots of chainsaws and sharks—in a meaningful yet original way. Whether you’re a Sharknado™ fan or not, we think you’ll enjoy this experience. Our goal with this game is for players to feel like they’re in their own Sharknado™ adventure—separate from the films, but still involving all the things that people have come to love about them. 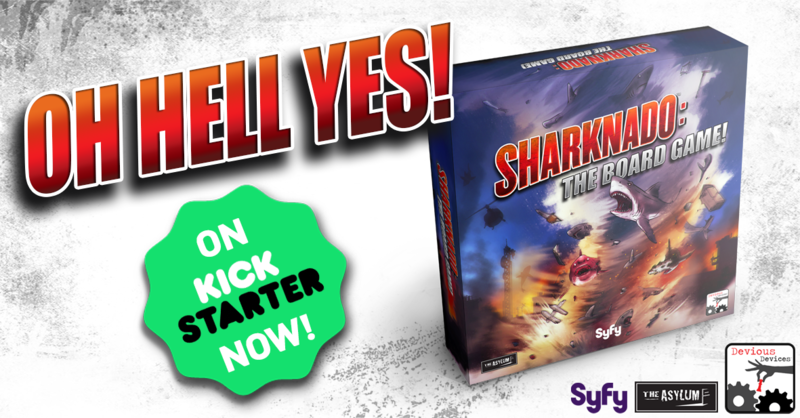 The Kickstarter campaign for Sharknado™: The Board Game! will run for thirty days, ending on Sunday, September 10, at 4pm EST. The funding goal is $49,999; a base-game pledge level is $54 and includes free shipping within the US, and discounted shipping internationally. A retail release for Sharknado™: The Board Game! is tentatively scheduled for early 2017. Sincere thanks to everyone who supports our endeavor, even if it’s spreading the word and letting others know about the game!